If you're searching for a compact SUV that you can drive anywhere, consider the fresh new Ford Escape. It's filled with features designed to keep you and your passengers comfortable and happy throughout drives of any length. Northside Ford Lincoln is knowledgeable about the different models available, and we can help you choose the right one for your needs. 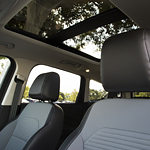 To increase the natural light that gets into the car, the Ford Escape comes with a Panoramic Vista Roof. It'll let everyone in the car have great views, and you can open it to increase the airflow to the car. To make it easy to put the parking brake on, it's equipped with an electric motor instead of a mechanically operated cable. You'll be able to put the parking brake on and off by pushing a button instead of struggling with a lever.